For the longest time, one had to assign an article by Mukul Kesavan – “Urdu, Awadh and the Tawaif, the Islamicate Roots of Hindi Cinema” – to go with a screening of Umrao Jaan, Mughal-e-Azam, or even Jodhaa Akbar. We now have what seems like a terrific book-length study of Islamicate influences – language, poetry, music, and so on – that have shaped Bombay cinema for several decades. The blurb informs us that Ira Bhaskar and Richard Allen argue that “it is in the three genre forms of The Muslim Historical, The Muslim Courtesan Film and The Muslim Social that these cultures are concentrated and distilled into precise iconographic, performative and narrative idioms.” More info here. A couple of years back, I chanced upon a set of Filmfare issues from 1977-78 being auctioned on eBay. And as luck would have it, I managed to get them (12 issues in all) for about $14! I figured I might as well use snippets from them and make “filmy flashback” a regular feature on BollySpace 2.0. To kick things off, here are some snapshots from the April 1978 issue that covered the Silver Jubilee of the prestigious Filmfare Awards! Best Actor: Amitabh Bachchan, for Amar Akbar Anthony; Best Actress: Shabana Azmi for Swami; Best Supporting Actress: Asha Sachdev for Priyatama; Best Supporting Actor: Sriram Lagu for Gharaonda; Special award: Amol Palekar for Bhumika; and a Special Award to Naseeruddin Shah for Manthan. Thanks to my colleague leo africanus, I could include Yizo Yizo, a groundbreaking and gritty TV show from South Africa, in my course on Global Media. Yizo Yizo is a terrific text with which to invite students to think about the question of “development communication” and the central role that this strand of communications research (carried out, for the most part, in mass communication departments in the U.S.) has played in shaping media policy in much of Africa and Asia. But what sets Yizo Yizo and Wetin Dey apart from other “pro-development” Miguel Sabido-inspired dramas developed in places like India during the 80s is the socio-cultural and political context – post apartheid South Africa. Where radio and television in India were imagined and controlled by the state as a means for integrating the “nation,” in South Africa, radio and television were central to the project of racial and ethnic separation. Yizo Yizo, however, is in many ways emblematic of “post-apartheid” TV in South Africa – by which I mean not just the re-structuring of the South African Broadcasting Corporation and the growing influence of transnational formats and genres on TV in South Africa (Big Brother Africa, for e.g. ), but also the ways in which TV has emerged as a key site for the re-articulation of cultural citizenship. And Yizo Yizo is a brilliant text to work with for the simple reason that it is so uncompromising – it lays bare the many issues troubling township life in South Africa (violence, drug abuse, sexual harassment, and so on) in unprecedented ways. And needless to say, the show generated tremendous controversy and attracted considerable public discussion. TV done right. While I’ve planned to screen an episode or two of Yizo Yizo in class, it looks like I now have to make time for another show – Wetin Dey, from Nigeria. 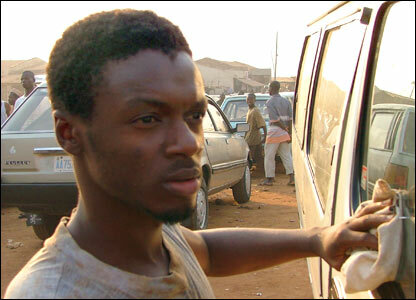 A story in the BBC says that this show, produced by group of international TV, film and advertising producers, is designed to raise HIV and AIDS awareness across Nigeria (here). Nigeria, as we know, gets talked about in both popular and academic settings in relation to Nollywood and the enduring popularity of Bollywood. I’m hoping this show (clips available on BBC) will help add another dimension to our understanding of media production in Nigeria and force us to think anew about TV and the question of “development” in an age of global flows – Wetin Dey is, after all, funded in large measure by the U.K.’s Department for International Development (DFID) and produced in collaboration with a number of NGOs. Bollywood ringtones and games have emerged as a key source of revenue for cellphone operators, and it is clear that cell phones, more than the Web, are central to marketing/promo campaigns when it comes to audiences within India (link). Of course, film songs have always worked as brand extensions – songs have been part of the publicity machine for several decades now and with every new medium, we’ve seen innovative uses of film music. While state-owned radio and television didn’t do much, satellite TV channels introduced a host of film music-themed shows – from top ten rotations to flashbacks to talent shows like Antakshari, Sa Re Ga Ma, and Indian Idol. And this has been so for several decades now. When All India Radio banned film music in post-independence India, producers in Bombay canceled AIR’s license rights and channeled music and advertising money to Radio Ceylon instead. While programs like Showtheme and Chitrahaar on state-regulated Doordarshan didn’t bring in much money for producers, the flow of film content on satellite TV channels during the 1990s was negotiated with considerable ease (the story of entire films being screened on “pirate” cable channels is a different story). As far as I know, no one has done any systematic work on this question of rights and specifically, how it has shaped the flow of film content across media and made processes of convergence less fraught compared to Hollywood. In fact, it might be worth thinking about the notion of “mobile Bollywood” in historical terms and across media and not necessarily specific to mobile phones. Bombay cinema and Doordarshan: Manjoo Singh on Showtheme! One of the most striking gaps in both popular and academic writing on Bombay cinema pertains to cinema’s convergence with every “new” medium – radio, state-regulated TV, cable and satellite TV, the Internet, mobile phone, and of late, video games. Of course, it is much easier to sit up and take note of all the trans-media flows in contemporary Bollywood. The question is, in what ways did earlier phases of media convergence set the stage? Did producers’ and directors’ experiences with Radio Ceylon and All India Radio shape their reactions to state-regulated TV during the 1980s? Did this in any way influence how film content was taken up by transnational television channels like MTV and Channel [v]? Over the next few weeks, I will blog about several interesting moments of convergence. And what better way to start than to return to the earliest instance of film’s convergence with television and specifically, a program called Showtheme! Some background: when state-regulated Doordarshan opened its doors to sponsored programming in 1983, signaling a departure from an earlier model of public service broadcasting with the express goal of utilizing television for “development” and “modernization,” some of the earliest and most popular shows were film-based. The Saturday evening Hindi language film, the film songs show Chitrahaar, and Show Theme, which used popular film songs and scenes to speak to a theme each week, always garnered high viewer ratings. In fact, by 1984 these shows had established an immensely lucrative “national audience” for Doordarshan. 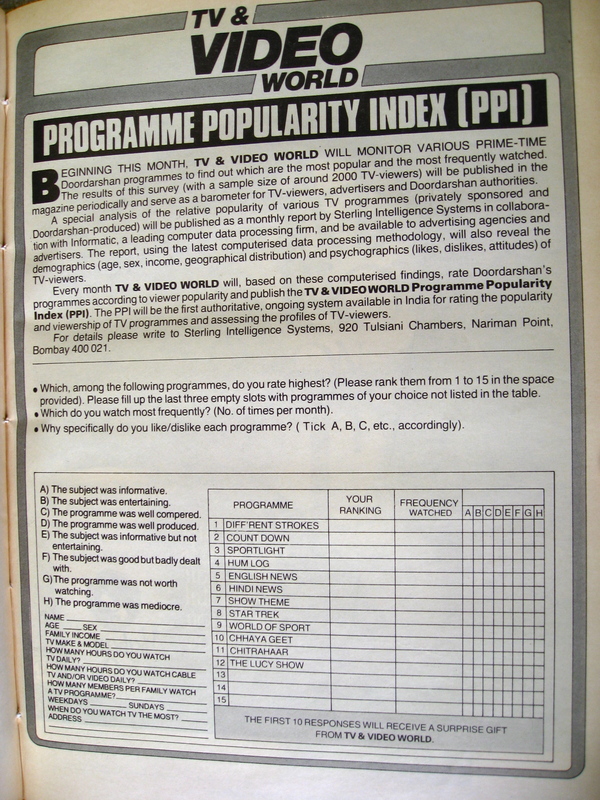 At the time, 1982-83, people at DD were thinking about sponsored programmes and Show Theme was the first one. Of course, there weren’t any other channels. Programs like Chitrahaar and the Sunday evening film was there. So at the time, Show Theme sounded like a good idea. We also connected themes to artists and these artists were getting TV exposure for the first time. For example, when Hero was released, we got Jackie Shroff to do a show on crime. At the time, people didn’t get to see much film-related material on TV. So for Doordarshan, Show Theme was great – they paid a fixed amount to us, and we would pay a part of that to producers for film material. The amount was fixed, irrespective of what movie it was or which star it was. But then, most producers and distributors were happy. Many of them felt that the show brought back the film’s saleability – a second release, maybe in smaller towns. And within Doordarshan, people were very happy and appreciative. For them, Show Theme was the perfect mix of entertainment and information. And I still remember, I received a lot of compliments from Hrishi-da [Hrishikesh Mukherjee]. He said he enjoyed watching and appreciated how we incorporated really good themes into the show – two shows in particular. One was on generation gap which showed how elders don’t understand youngsters and vice versa. That program was very effective because we touched upon all angles of the theme. We used clips and songs from Guddi, for instance. When that program went on air, I got calls from schools in Bombay saying we want to use it in our classrooms. On that level, it was entertainment but it was also information. The other one was a theme called koshish (effort), and we talked specifically about organ donation. We got letters from people after that show also. In some ways, we did then what soaps are doing today – getting a sense of many aspects of life, at an everyday level. Show Theme had a first run, and then we re-started it. That time, Hero released so we got Jackie Shroff to do a show on crime. Then Meenakshi did one. We did a show with Anupam Kher because Saaransh had come out then. So we connected themes to artists. And these artists were getting TV exposure for the first time, showing them as they really are. So when an actress or an actor came on TV and were just being themselves, people were really interested in that. But I tell you, the research used to take a long time – we had to pick the right scene for the right theme and we did not have a large staff or anything. I have spent many, many hours thinking about and going through so many films. Actually, my involvement with films goes back…I was making film-based radio programs also. There were sponsored shows on radio. Like there was a show called Kal Aaj aur Kal on film music – an interview with a singer or a music director. I remember Laxmikant Pyarelal, Lata Mangeshkar, and so on. It dealt with old film music – to show how the trends in music had evolved, how things had changed from the 50s and 60s, very nostalgic. And of course, some information about what they were doing now. Then another show called Awaaz-e-Andaz – a drama kind of show, a dramatic narrative. And the film dialogues would be played – people would identify which film or artist it was. There was a prize…people would send in letters. Films are so into everyone’s minds and hearts – I mean, people remember dialogues and scenes so well, it is amazing. And in 1983, when the opportunity came, I moved into TV. And Show Theme was first sponsored by Limca and Ponds. The Show Theme team was not large – I had a writer and a researcher. She used to write the script for the theme and supervise the research. It wasn’t easy at the time to get films. We used to identify clips and then go to the distributors, transfer reels to tele-cine, sometimes the whole reel. We would shoot the stars in this one studio we had in Bombay. Then the second person was a production person who used to deal with permission, payment, getting reels – acquisition – coordinating with artists to set up dates, etc. Very early on, there was an agency involved owned by the person who publishes Stardust so they were involved. And they got the clients. They used to help us get artists. Their role was – because they were getting the sponsors, they used to help us with the show. They didn’t interfere with the creative process at all. I can’t tell you how popular it was – it was at 11 on Sunday mornings. There was nothing else to compete with at the time, you know. But I also think it was really good for its time. Dramas like Hum Log and comedies like Yeh Jo Hai Zindagi happened later – this was December 1983. And I remember, Show Theme was on the cover of TV & Video World, the only trade magazine at the time. Within Doordarshan, people were very happy and appreciative. And within the film industry, producers, directors and stars were also happy and I made several friends. Everyone was appreciative and in those days, they felt that the show brought back the film’s saleability – a second release, maybe in smaller towns. It worked and it was popular. People’s response was good also. I meet people who were young at the time and they remember some of our themes. I should tell you – we did a very nice show with Ila Arun at the time, where she sang these Rajasthani songs on TV. At that time, I was told by Sanjeev Kohli that they discovered her and did a record with her because of Show Theme. Think about it…Ila Arun – Indian Idol for that time! Watching Iruvar (Maniratnam’s film that traces the political careers of MGR and Karunanidhi) a few days back got me thinking about Bombay cinema’s “national” status and specifically, the idea that Bombay cinema managed to forge a “national audience” in post-independence India. It is difficult to imagine a large audience for Hindi films in Tamilnadu given the agitations and struggles against the imposition of Hindi that defined politics in Tamilnadu for over three decades (from the late 1930s-early 1970s, chronology here). Anti-hindi protests organized by E. V. Ramaswamy’s (aka Periyar) in 1938 were taken up by other prominent politicians and served as a major campaign issue for the DK and DMK parties (more here). And I also wonder if distributors and exhibitors in Tamilnadu during this time period needed to bring in Hindi-language films given the strength of the Tamil film industry and the close ties between the Tamil film industry and mainstream politics. My grandparents and parents lived in Madras during this time and were generally supportive of the anti-Hindi platform, and tell me that they did not get to watch many Hindi films during this time. An occasional big-budget Raj Kapoor film, but nothing on a regular basis. Besides, neither they nor anyone in their circle of family and friends spoke or understood much Hindi. Yet, they are all fans of Hindi film music! Their anti-Hindi sentiments did not, in any way, interfere with their ritual of tuning in to Binaca Geet Mala (Radio Ceylon) and listening to the most popular Hindi film songs of the time. And once All India Radio relented and began broadcasting film music on Vividh Bharati, the popular Chaya Geet became a part of their daily routine. To this day, my grandfather spends a few hours each week listening to compilations of songs by playback singers like Talat Mahmood, Lata Mangeshkar and Mohammad Rafi even though he doesn’t quite comprehend the lyrics. I think our narratives of Bombay cinema’s mediation of the “national family” (and perhaps more broadly, of nationalism in postcolonial India) will be so much more interesting if we take into account the role that radio played. 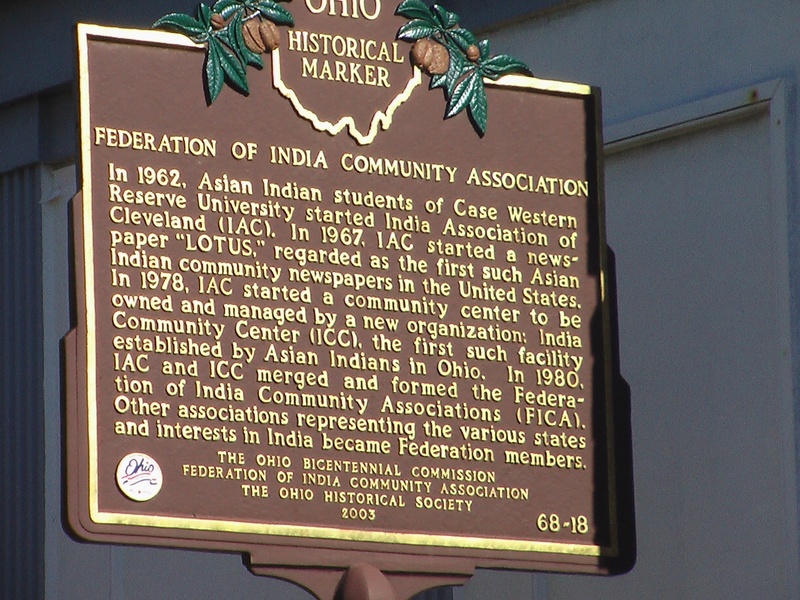 I came across this wonderful “historical marker” while driving around in the University Circle neighborhood of Cleveland, and it got me thinking about the critical role of Indian Students Associations in shaping ideas of being and becoming Indian-American (especially during the early phase of migration – late 1960s-1970s). There have been a number of academic articles and books that map different realms of the Indian-American experience, but there isn’t a good ethnographic-historical account of “Indian” student associations. And now I’m also curious about what “LOTUS, the first Asian Indian community newspaper,” can add to our understanding of media and diasporic identity during the late 1960s. Until I came across this historical marker, I believed that the story of print culture in the Indian-American diaspora began with India Abroad, a newspaper started by Gopal Raju in 1970 (in New York city).